Fanzz has grown to be one of the largest sports apparel and merchandise providers in the Western United States. Fanzz is focused on providing excellent customer service and delivering high quality products to sport's fans everywhere. Fanzz has excellent vendor relationships with companies like Reebok, Nike and Spalding, which enable them to get the hottest NBA , NFL , MLB , NCAA, and NASCAR products to their customers as soon as they are available. Save on your next sports purchase with Fanzz.com discounts, Fanxzz.com coupons and Fanzz.com savings from 58Coupons.com. When you sign up for the Fanzz club on Fanzz.com, you'll receive a 20% discount on select items. Click link to sign up. Act now and you can save 10% off your order from Fanzz.com. Just use this coupon code and enjoy! 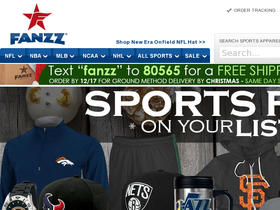 Click link to check out the free shipping options on select sports merchandise from Fanzz.com. Don't miss out on the clearance section at Fanzz.com where you'll find savings up to 80%. Click link to browse selection. Support your team with a hat or cap from Fanzz.com, now from as low as $21.99. Click link to choose your team. Make your own jersey with your own number starting from just $99.99 at Fanzz.com.